Against all your wise advice, I've cut out the coat and started construction. BTW here's a photo of the design. Black flannel... Yawn. Maybe now you can see why a contrasting collar might bring this severe design a little life. One of the photos shows the wool glen plaid fabric that I'll be using for the upper collar. It's shot through with rust and purple, so it coordinates nicely. The first step in construction is the welt/flap pockets. Thank goodness I did a dry run on the muslin. These have to be the most over complicated pockets in the world, and I immediately went running to my Bishop Method book for advice and a more reasonable alternative. According to Edna only 3 pieces are required, an upper and lower pocket and the welt. The Japanese nightmare consists of 5 pieces, one of which is a piece of the fashion fabric sewn inside the pocket that will never be seen. Sorry, that step is out. I did keep an interfaced piece of my fabric placed above the pocket and held in place with top stitching. Because this is a Fall coat, and I love warm hands, I used flannel for the lower pocket and a piece of lining material for the upper pocket. I'm glad this step is over. The next challenge will be an inside chest pocket, but I will need to cut out part of the lining before attempting it. Getting this project off the ground has been a challenge. It should have been cut out and half sewn by now. Hmmm. wasn't this supposed to be my Fall coat? The sticking point has been that, try as I might, I can't align the grain of this fabric. Nothing so far has been easy. The weft fibers on this brushed twill are very fine and fragile, so I was unable to pull a thread across the width of the cloth. Instead I had to tear the fabric. But what I assumed would be a little 1/2" strip turned into a whopping triangular hunk about 8" wide. With the ends basted together a la Edna Bishop the fabric skews off on an impossible angle. Hopefully the pictures give you the idea. I immediately ran to the Pattern Review message board and received a variety of responses on how to remedy this problem. The most common suggestion was to dampen the whole mess and try to stretch / coax it back into shape. Using the London Shrink method I rewet the cloth and struggled with it for over an hour. All the pulling, smoothing and swearing was to no avail. Then I attempted to subdue the beast with the iron. I surrender! There is just no way to turn this giant twill parallelogram into a neat perfectly aligned rectangle. Sorry Edna! 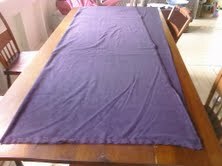 I've folded the cloth down the center, aligned the selvedges and will cut out the imperfect coat. I've finished the muslin for coat #2. It has all the charms of a phlebotomist's lab coat. I hope you're not squeamish at the thought of blood! I was actually able to incorporate the adjustments that I made to the duffle coat "on the fly" so to speak. I added 1/2" to the shoulder width, and an additional 4" around. The fit may be a bit snug with a sweater and flannel shirt, but the raglan sleeves have me totally intimidated, and I have that "quit while you're ahead" feeling. The sleeves ended up about 1" too long, an easy fix. Even though this seems like a lot of work, I've really come to see the value in making a fitting muslin. In the case of this coat, it's helped me figure out the whole placket front. (How do the buttons get hidden???) I also know that the collar is going to be major challenge. Speaking of the collar, I'm going to be shopping for a contrasting fabric for the upper collar. Corduroy or maybe wool in a contrasting color. Plaid? This coat is screaming for a little "zing".